Why Choose a Wood Door? 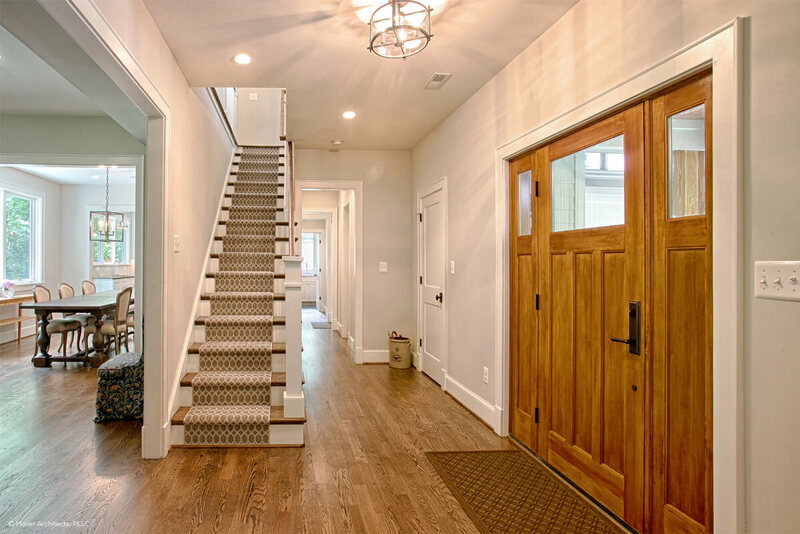 When selecting the right door for your home, there are many factors that go into the decision, but typically one of the first is whether the door should be wood, fiberglass, or steel. While it would be no surprise that we feel wood is the best choice for your door, we believe it is important that you understand the "why." And here are just a few of the reasons we believe you won't want to choose anything other than a wood door for your home. Personalization throughout the home is becoming a mainstay in design trends. The truth is, homeowners want to add their personal touch to the home because they want it to reflect their personality. Just like each person is unique, so is each door that is made by Simpson. We don’t have a press that stamps out metal or fiberglass doors. Our wood doors are crafted from different pieces to not only ensure quality construction, but to provide a one-of-kind door. And because wood is a natural resource, no two pieces of wood are alike. This results in a beautiful, natural looking door that is uniquely your own. We have been manufacturing wood doors for over 100 years and have never stopped looking for ways to improve their strength and resilience. Anytime you work with a natural resource like wood, there are countless efforts that go into understanding how to best cut it, route it, shape it, glue it, and ensure that it lasts while maintaining its natural beauty. As an example, we have a special process when we glue staves of sapele mahogany to themselves. The process is unique to sapele, as the natural make up in the wood requires it. And this is exactly the type of innovation that only occurs with expertise developed over time. What does this mean? 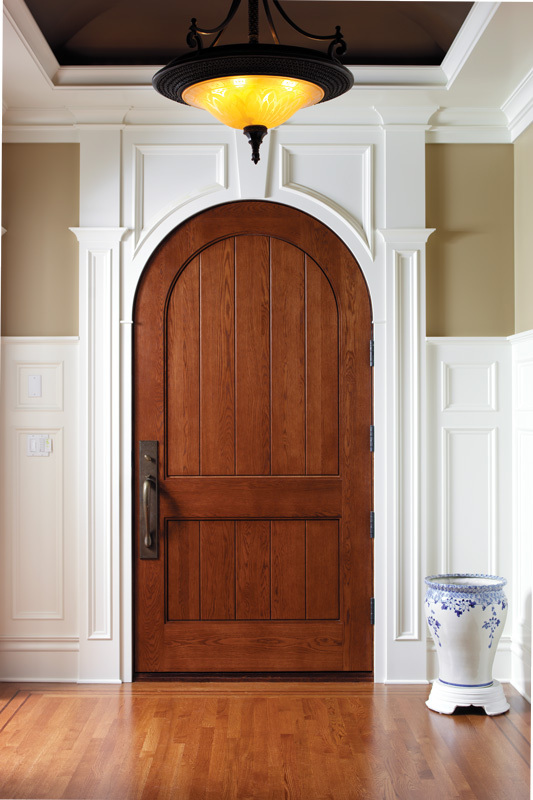 It means that you can be sure when you purchase a Simpson door, you are purchasing a door that will last for years to come and was built with over 100 years of experience. Whether your door will be the focal point of the room, or an accent piece to your design, the styles and looks you can achieve from different woods are virtually endless. The first item to consider is the grain of the wood. Do you like grain that is straight or wavy, tight grain or wide/open grain, or grain that is close to each other or far apart? Both the type and cut of wood will determine its grain. Another consideration is color. Each type of wood has its own natural color and most woods can be stained to achieve a wide variety of different colors. For example, a fairly light wood can be made to look very dark simply by using a dark stain. To ensure you get the exact look you want, consider asking your authorized dealer for a sample of the wood type you are considering and do some stain tests yourself. With so many options and wood species to choose from, it can be tough to make the right choice. 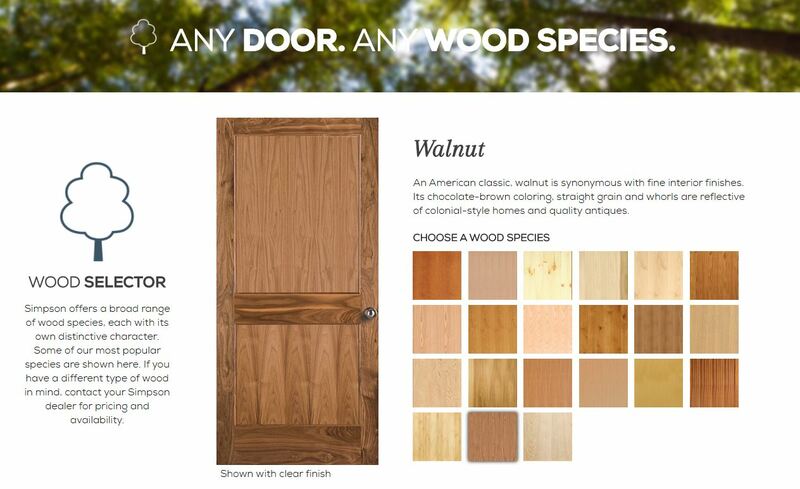 You can easily explore some of the more popular wood types for doors on our Wood Species Selector Tool. Ordering a Simpson door made of wood gives you complete design freedom. You can order any quirky size to fit a remodeling project or maybe you want to go really big for that impactful front door or trendy barn door. Your door can have any shape – arch tops or two doors that share an arch are very popular. 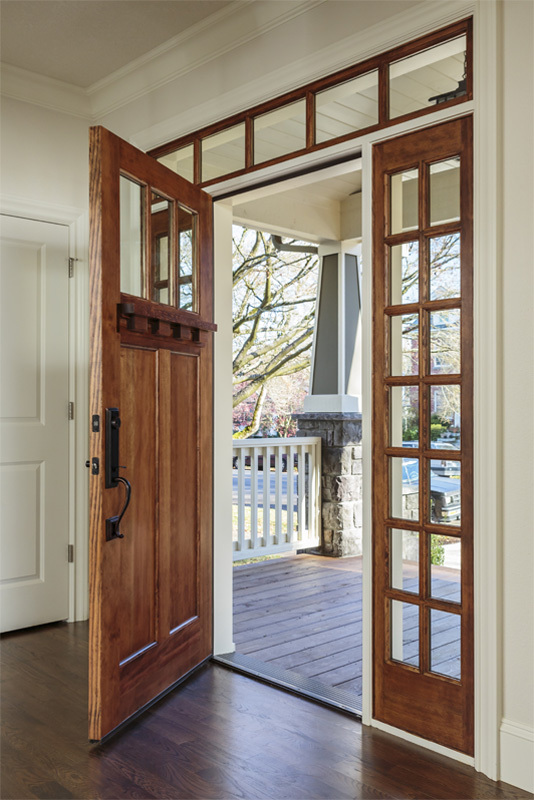 Dutch doors are enjoying a revival for their practical use and cozy look. Any flush door or any door with an intermediate rail can be made into a dutch door. There are virtually no limitations and this flexibility is something you will not find with doors made of steel or fiberglass. Do you offer impact rated exterior doors and do you install? Please send me additional information about Simpson’s special offers, products and services. Our interactive design tools will help you create your perfect door.